Adobe has released a significant update to Bridge CC, its venerable file management program. Where Photoshop and Lightroom have seen multiple incremental updates over the past few years, Bridge has been left somewhat alone. That all changes today with multiple improvements including improved cache management, and an option to import images from external devices including iOS and Android mobile devices. Sluggish performance, especially when displaying large numbers of thumbnails has been a perennial complaint among photographers who use Bridge. And although it has taken a while, Adobe seems to have listened to those complaints. Thumbnail previews are now generated on-demand rather than all at once, and metadata is loaded first so that filters can be used before all thumbnails have been generated. In another effort to boost performance, Adobe has introduced improvements to its cache management to automatically purge stale items when Bridge is idle. This Bridge update also re-instates a feature that automatically identifies and stacks images shot in a sequence either for an HDR or panoramic composite. Bridge CC version 6.2 is available for download now. 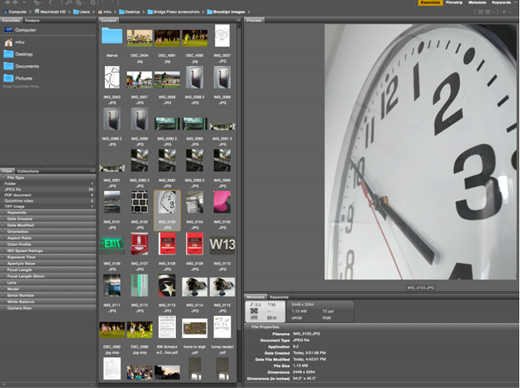 Today we are pleased to announce the release of Adobe Bridge CC version 6.2. Bridge was brought back to be managed by Megan Donahue, Director, Creative Cloud and Arno Gourdol, Sr. Engineering Director, Creative Cloud and their awesome teams. Arno is no stranger to Bridge since he has worked on several past releases. Our team has been working on several new initiatives that enhance user experience around asset management used by Creative Cloud customers. Most recent initiatives launched by this team include collaboration features in Creative Cloud as well as Creative Cloud Assets, and Creative Cloud Libraries. The central cache of Adobe Bridge stores thumbnails, previews, and metadata information in a database. This database improves the performance when users browse or search files. However, the larger the cache, the more disk space it uses. Cache preferences help you manage the trade-off between performance and cache size. 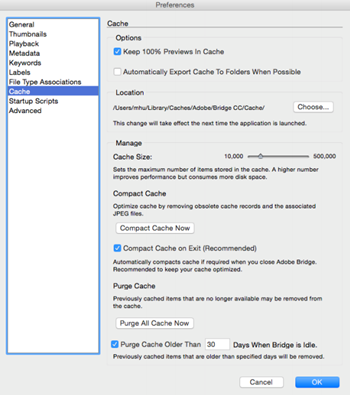 We have worked on improving purging cache capability, which is an existing feature in Bridge. In this update, automatic purging of stale cache items has been enabled when the application is idle. We are also providing a cache compaction option to set up cache clean-up at exit in case the database size increases beyond a certain size. Both these options improve performance of the application and help keep the cache and database clean over extended periods. For more information see, Work with the Adobe Bridge cache. To improve the responsiveness of Bridge when you are browsing through a large set of assets, we have made improvements to the way the thumbnails, previews, and metadata are extracted/generated. Now when you select a folder, the thumbnails/previews are extracted on priority for only the on-screen assets. The thumbnails for the remaining files are either generated on demand (when you scroll down/up) or when the application is idle. The metadata extraction happens on priority for all assets, thereby enabling the filter panel and search to become functional sooner. This change enables you to work with bulky folders without any performance issues like hangs and not-responding states. With this change, you will now have a fully updated Filter panel even before all the thumbnails/previews are generated. 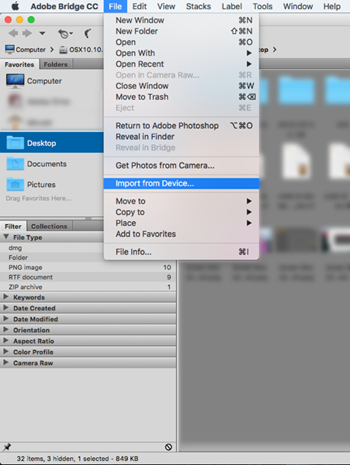 This will also enable you to search for the files even before all the thumbnails/previews are generated. In this update, an alternative to import media from these devices has been provided. You can now choose File > Import From Device to import media from the devices. Note: This is a Mac only feature and launches Apple Image Capture to bring files from devices into Bridge. We also reinstated Autostack Panorama/HDR feature. Given our focus was on stability and performance of Bridge, we have made significant updates to the core technology components. This will set the foundation for a technology platform to enable future development and modernization of Bridge. Our team is very excited to bring this release as a stepping-stone for the work we have set out for 2016!